Forum Index > Historical Arms Talk > Early Landsknecht armor? Posted: Tue 09 Aug, 2016 12:37 pm Post subject: Early Landsknecht armor? Does any know what type of breastplate and/or body armour was most common among the Landsknecht from 1487-1500? And how much credibility does the "no backplate" rumor have? p.s. I am mostly talking about foot soldiers and not officers. Maximilian I commissioned thousands like the one I attached to equip his troops. As you can see a back plate was available but they really did go without it fairly regularly. IMO this is a highly historically significant cuirass that well deserves quality reproduction on a large scale. If they had backplate readily available, why didn't they use it often? Did it have something to do with firearms? The top two overused explanations for things in the arms and armor community are probably firearms and fashion. In this particular case I don't know of any record of a hauptmann or other concerned party stating exactly why they commonly dropped the back plate. Taken in context of the rest of their gear and the way they fought which are subjects we do know something about it seems pretty clear that they often chose to go without a back plate because it saved them several pounds on their overall loadout yet cost them only a small fraction of their passive defense, probably something on the order of 15%. When an set of chest armour has been made with a backplate it is actually impossible to wear the breastplate without the backplate as all of the straps are mounted on the back plate. Wearing the breastplate on it's own would require manufacturing and mounting both straps and additional buckles and is not something you do on the spur of the moment. A breastplate that was worn on it's own had most probably been made to be worn alone from the very begining or been deliberatly altered by an armoureer. 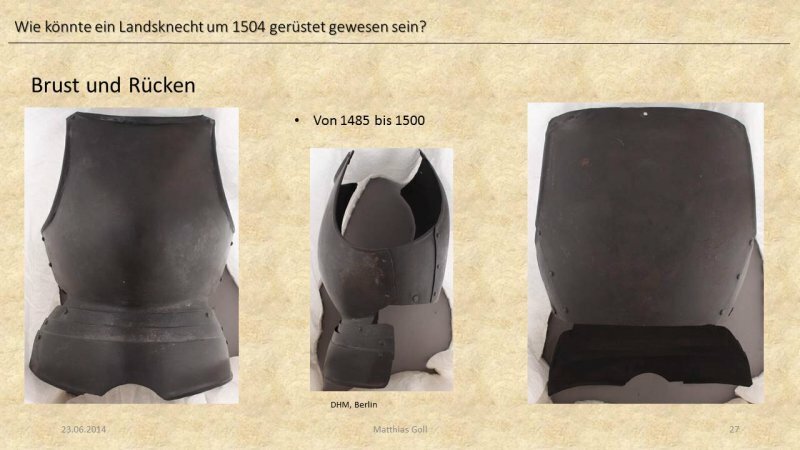 Maximilian's surviving archive actually shows that some of the infantry armour he purchased and issued was breastplates only. 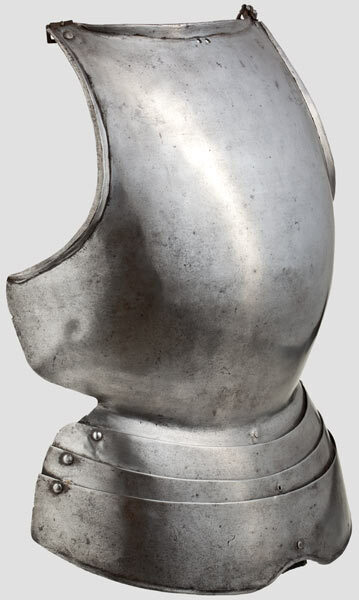 Based on my on my practical experience with landsknecht armour and pike fighting the backplate provides a good deal more than "15%" of your actual protection in combat and there is a significant difference in how vulberable you are with or without it. Because you stand sideways when using the pike the back or rather the rear half of the side of your body gets more exposed than one thinks. When we started sparring with pikes we were suprised by the number of thrusts that were able to hit that area and it made it quite clear why the doppelsöldner who formed the front ranks were required to wear fairly extensive armour. 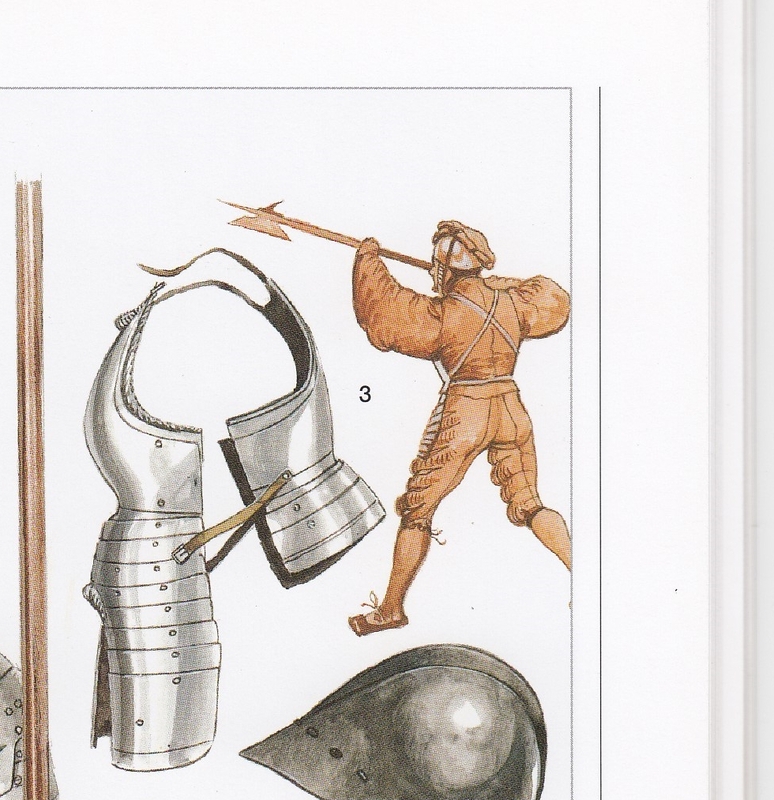 One very good source for early Landsknecht armour and apperance is the drawings by Paul Dolnstein who served in a number of campaigns as one. 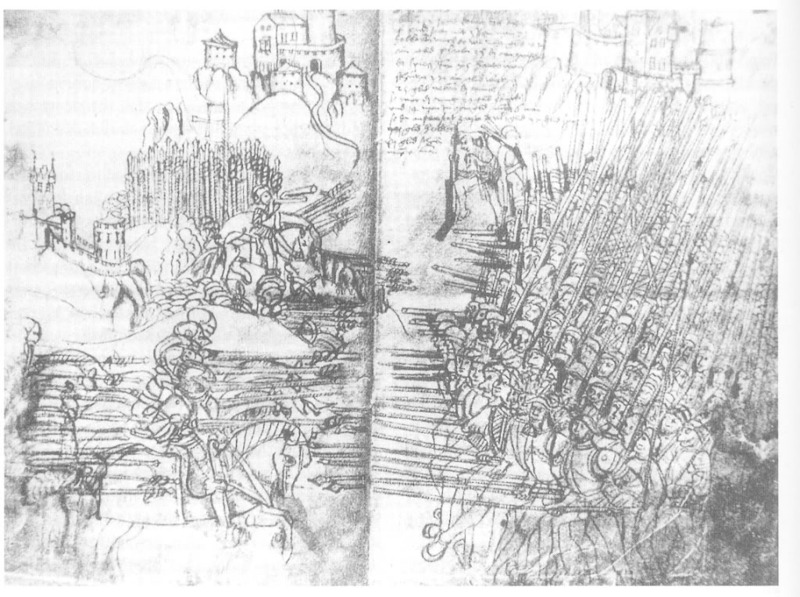 In particular he both drew and provided written descriptions of the armour in use during the 1502 Danish-Swedish war and the 1504 Landshut war. It does show the strapping used to secure a breastplate without a backplate. That's a great resource, thanks for sharing! Because you stand sideways when using the pike the back or rather the rear half of the side of your body gets more exposed than one thinks. I know I'm not going to change your interpretation via the internet but you really shouldn't do it that way. It doesn't matter though, I'll totally ignore defensive patterns too and focus on the gear itself. That back plate only covers a small portion of the anatomy, it doesn't cover the lower back or pelvis which are large and easily struck targets full of vital structures that when damaged can leave you immobilized, paralyzed or dead. It also doesn't cover the uppermost portion of the back, to say nothing of the limbs. It's *at best* what? between 1/4 or 1/5 of the target area on a side of your body you shouldn't be regularly exposing in the first place. Any way you look at it a very large number of foot soldiers who wanted a breast plate didn't feel the back plate was worth it in the grand scheme of things. When we started sparring with pikes we were suprised by the number of thrusts that were able to hit that area and it made it quite clear why the doppelsöldner who formed the front ranks were required to wear fairly extensive armour. Well, I know I wouldn't want to stand in a pike block without extensive armor! Do we have any reliable figures on their attrition rates? On the one hand it looks like it would have to be staggering, on the other hand there never seemed to be much of a shortage of men willing to take their chances. What about the factor of price? 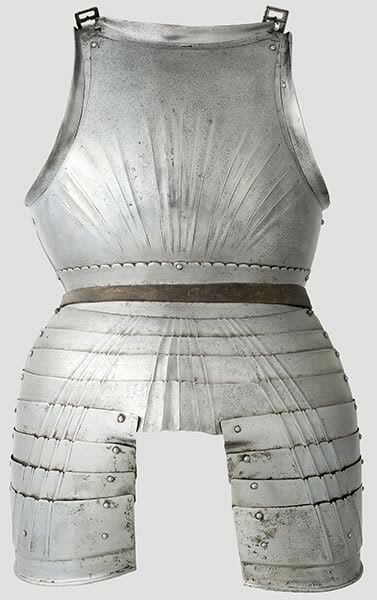 If Maximilian commissioned thousands of sets of armour, leaving out the back plate would probably reduce the cost by half. Financial considerations should not be underestimated, particularly since no emperor had unlimited coffers to draw upon. Looking at it another way, if he had enough money to pay for 1,500 landsknechts dressed in back and breast, then (assuming leaving out the back plate reduces the cost by half) he would have enough money to provide 3,000 men with breastplates. Considering how many more men would be at least partly armoured, only commissioning the breastplate might have been immensely practical from a strategic sense. Glad you liked it, the painting in question is a fascinating source and I spent 30 odd minutes discovering new details and taking additional photos of it a couple of weeks ago. You might be surprised by my willingness to change my interpretations when supplied with historical sources and good arguments so if you are willing to write more on the subject I'd be happy to read it. Our intrepretation is based on Swedish, Dutch and German sources, granted many of them are from the 1590-1670 period but they include bth military manuals and veteran accounts. We have place much weight on the reported frontages of combat units. I'm out of time at the moment but more details to follow. That's not an unreasonable assumption, Craig. The trick here is that for whatever combination of reasons this particular time frame, the late 15th/early 16th century saw the mass production of high quality armors at affordable prices. The particular cuirass under discussion actually incorporates a number of cost-cutting features that would reduce the price relative to a number of other common armors of the time. For example the curves are relatively simple, minimal fluting, the faulds are constructed in such a way they can be adjusted in or out... the shape of the top of the breast and back plate accommodates some variation in fit though personally I believe that mobility was the bigger concern. Nevertheless Daniel is correct that breast-plate-only variations exist, whether that was aftermarket adjustment by an armorer or they were made that way I can't confirm but I'd lean towards taking Daniel at his word. Digging through my archives I found some more pics I have of that pattern of brustharnisch and I found what I believe is a more intact example of the back plate which incorporates faulds for additional protection over the lower back. I didn't have any pics of the breast-plate-only configuration but that is likely just selection bias on my part, I've been thinking about commissioning this brustharnisch for quite a while and I was interested in the complete setup. Daniel, as far as stance goes I would suggest trying your feet and hips (nearly) sideways to your opponent/s and square your torso more. Point your knee at your opponent but I'm sure you already do that. This does two things,first it gets you better coverage from your breast plate and second it allows you to step forward with a thrust and rotate your torso adding strength and solidity from your core and body weight to your action. In my experience this is a little different than how many Eastern martial artists and modern sport scientists approach body mechanics but is the most common case for the great majority of traditional Western martial arts and many other athletic and even dance activities. You definitely will still expose a bit of your back at times and there's ways to account for that either with help from the other guys in your ranks, your timing or peculiarities in the execution of particular offensive or defensive actions but unfortunately that's all stuff that's much easier to show in person. Too bad we're separated by an ocean, I'm actually a really huge enthusiast of the KDF staff weapons and I bet we'd have a lot of fun playing pikes together. Oh yeah, again easier to show than tell, but there's a neat trick you can do with thrusts from weapons that don't have a cutting edge like a small sword, epee du combat or in this case a pike... allow an incoming attack to miss you by just a little bit, then when the point is past take opposition against the shaft of the weapon with your body and ride right up it to land your blow. 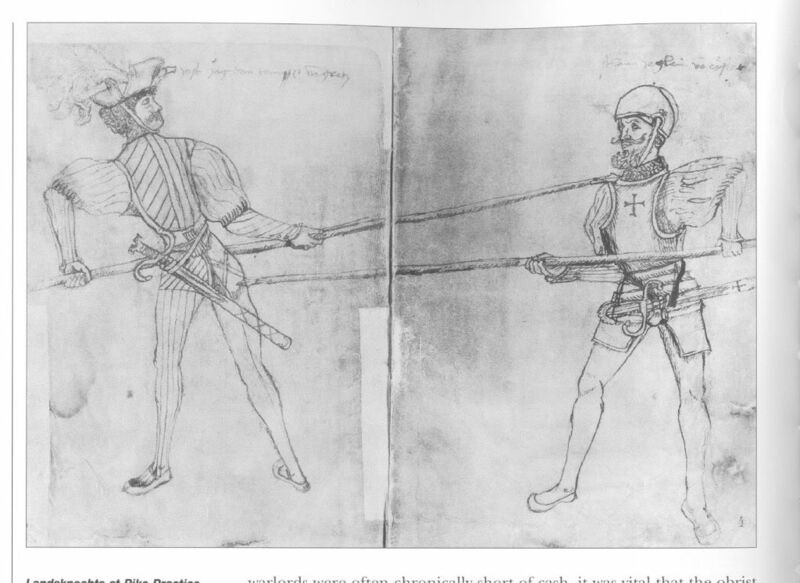 If you're familiar with how you use the guard on weapons like the rapier, small sword, saber, etc to "snowplow" past an opponent's blade it's essentially the same thing except you're using your back/shoulder/traps/arm/whatever instead of your weapon and again, don't try it on cutting weapons unless you're appropriately armored. Anyway another point of consideration with a sideways initial stance is that it exposes what is these days called the "armpit gap" in your armor, they can go right through the arm hole or even your shoulder and reach the vitals. It's just much more effective to square up your torso in a leger stance when wearing torso armor, modern police and military circles seem to have independently discovered that in the 20th century as well and squaring up when armored is commonly taught in combat shooting today. 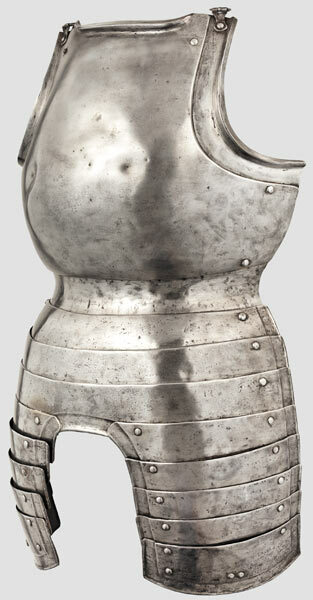 A similar breastplate from Hermann Historica which probably belongs to the same large order, a few diffrences in how the last plate of the fauld is shaped for example and it does have hinges. But the hinges could be a later addition. IMHO the presence of the cut-outs above the fauld strongly points to the breastplate being made to be worn alone, however it is not t impossible use it together with a backplate from technical viewpoint. But both the artwork and preserved armour seems to suggest that breastplates worn with a backplate tend to lack the cut-outs. Thanks for the great pics, very useful! In generall, I often see portrails of landsknecht wearing literally little to no armor at all, helmet included. Dolstein is perhaps the only execption I know so far. I know Landsknecht used to hate wearing armour outside actual battles, so that's probably explain why the carvings shows them in a more "casual manner" (as if they were in daily campsite live). Still, I have to ask: is it true that most of the Landsknechts, at least in the period 1487 to 1515/1525, were known to not be so armoured as, for example, the swiss were? The aketon or other padded garment was worn beneath the clothings to ease the cuirasses worn other their dresses? There are more artists than Dolnstein who show armour being worn by Landsknechts, The "Weiss Kunig" illustrated by Hans Burgkmair contains armoured Landsknechts in just about every one of it's numerous battle scences, Hans Döring, Erhard Schön, The Petrarcameister and Albrecht Dürer also depicted Landsknechts in armour. There are others as well but many of the less well known or anonymous artists are hard or impossible to find online, rather one has to use specifik books or visit museums. In general you will not find much armour in the classic Landsknecht "portraits" as the pictures of single landsknechts were seldom intended to show them in battle or ready for battle. The focus is much more on their elaborate dress. I doubt you will find period sources that state that Landsknechts "hated" to wear armour outside battle, like just about all 16th Century soldiers they saw no reason to wear armour when it was not needed and when possible armour was transported by other means than the owner wearing it when on the march. It is usually the case that the Swiss are considered to have been less well armoured than the Landsknechts but just what this conclusion is based on is hard to say. There certainly are some documents and musters which show only limited amounts of armour in use or complain about the lack of armour but again it i hazardous to draw sweeping conclusions from such limited material. Aketons or padded garments are not in evidence beyond one or two very rare depictions that could possibly be interpreted as padded garments. With a properly made wams & shirt your really don't need a padded garment under the armour as you already have multiple layers of wool, linen and possibly silk. Of course the armor will not be as well fitted to the body as the custom made or semi-custom made armour of the nobility and heavy cavalrymen but the fit is good enough for foot combat. 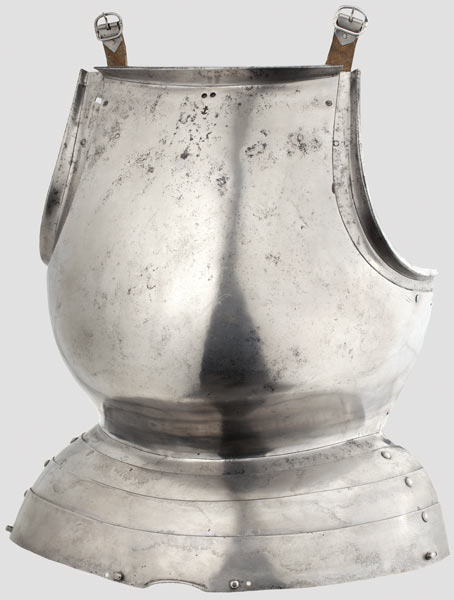 Paul Dolnstein refers to this type of helmet as a "hirn", short for "hirnhaube", the Dolnstein version seems to be related to the sallet but the name was applied to a variety of shortend sallets and skull caps in use among both Landsknechts and the Swiss. These helmets can be seen in the artwork of Urs Graf, Hans Burgkmair and Jan Cornelisz Vermeyen to name some of the most easily found artists. 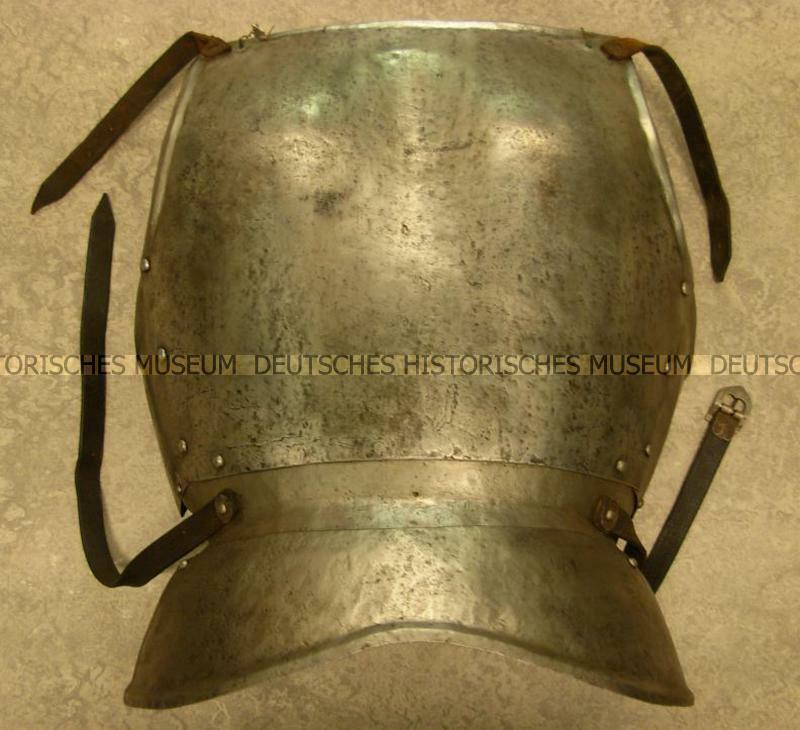 Before the introduction of the "sturmhaube" (burgonet) it is the helmet most commonly associated with the Landsknechts. 99.9% of the time your armour is just something heavy and uncomfortable to carry around or stand about in. Droping the back plate save you from carrying the 2kg or so of steel. In generall, I often see portrails of landsknecht wearing literally little to no at all, helmet included. Dolstein is perhaps the only execption I know so far. There are more artists than Dolnstein who show being worn by Landsknechts, The "Weiss Kunig" illustrated by Hans Burgkmair contains ed Landsknechts in just about every one of it's numerous battle scences, Hans Döring, Erhard Schön, The Petrarcameister and Albrecht Dürer also depicted Landsknechts in . There are others as well but many of the less well known or anonymous artists are hard or impossible to find online, rather one has to use specifik books or visit s.
In general you will not find much armor in the classic Landsknecht "portraits" as the pictures of single landsknechts were seldom intended to show them in battle or ready for battle. The focus is much more on their elaborate dress. That would explain why I often see landsknecht with their traditional arms but almost without armour. Except, of course, to the usual bishop's mantle, which seens to be quite common in whenether representation. I'll look for the other authors, but since we are talking about Dolstein, one of the things Heath says about such illustrations is that you can't see a single zweihander at all. He claims it was latter addition, with halberdiers performing the doppelsoldner's duty by themselves. Do you know the earliest known reference for zweihanders? Or at least the earliest reference you know so far? Mike Ruhala said Kaiser Maximilian I comissioned thousands of the munition-blackened up above and Craig Peters also said that he was able - or possibly able to - comissioned at least 1,500 sets of front-and-back cuirasses for his landsknecht (though I don't know how he made or based that assumption). Then I ask: how often did the Emperor, the Prince Employer or the Obrist granted to his troops? And how much? 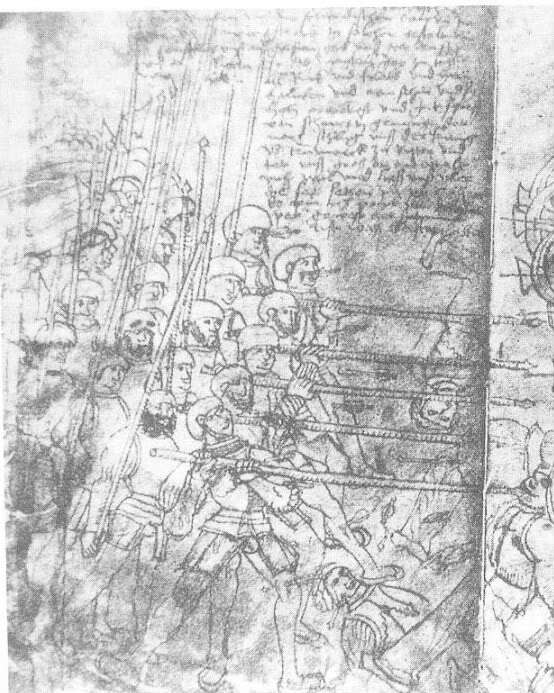 Heath says armour are likely to have become more and more rarer amoung landsknecht from the evidence we have at Dolstein's drawings to the later 16th century sources. Duby claims they were lightly clad by the earlier period and heavier by later on; I guess his statement is based in the Battle of Stoke Field (1487) - when english longbowman pierced down most of the landsknecht contingent - and in the First Siege of Viena (1529). Well Dolnstein himself says that "we" (= german landsknechts) were 1800 men. It fits very well that the Danish army under the Danish King would have been about equal in size with the 15.000 swedes coming to meet them (otherwise the Danish King surely would have retreated). No sensible King would ride into battle alone with only mercenaries. They could just capture him and sell him to the enemy. What happened is likely as the two armies lined up, the Danish King ordered the landsknechts forward to push a hole in the Swedish line, which then succeeded and brought victory for the Danes. That's why the landsknechts were knighted and well paid for their services. The mercenaries turned up with their own equipment and with a bonus like after this victory, they could improve their gear. So a successful band of landsknechts should be expected to have better gear, than a newly formed group (unless it was created from already experienced veterans). The Danes had a few years prior used landsknechts in the abysmal failure, where a Frisian peasant army destroyed a numerically vastly superior Danish army of noble cavalry and Dutch landsknechts (Great Guard) lead by King Hans at the battle of Hemmingstadt in Ditmarsken (1500). So then a 13.000 strong army included 4.000 landsknechts. The Danes lost the original Dannebrog flag, which according to legend had fallen down from heaven at the Battle at Lyndanisse (Talinn) in 1219 (though in earlier accounts it was at Fellin 1208, also in Estonia). So this defeat probably were the reason for the Swedish uprising. The Kalmar Union King had lost all prestige by losing to a peasant republic and losing the Danish sacred flag to the Frisians. The Frisians hung it as a trophy in the Church of Meldorf. So Dolnstein and his fellow landsknecht really saved the "landsknecht" name as a fighting force in the Danish eyes and for a few more years kept the Kalmer Union together with this victory. Dolnstein grossly exaggerates the number of Swedes, the army at Elfsborg was only local levies from the province of Vastergotland not a national effort. (And even when mustering a "national" force it was not possible to gather and sustain a force of 15000. Even the later Vasa Kings with their firm control of a central goverment and a regular army was hard pressed to reach that number.) The actual number was at most some 3000-4000 men, quite possibly less. Swedish rising against King Hans had nothing to do with any lost prestige but was the result of long standing resentment among the Swedish nobility against his habit of puting foreigners as governors of Swedish castles, positions they saw as their natural right. With the destruction of the Grosser Garde King Hans had lost the very military unit which had granted him victory of the Swedes in 1497, with the feared Landsknechts gone and the Danes in general disarray the timing was right for an insurrection. The Kalmar Union died well before 1502, I'd say that it was effectivly gone when Christoffer of Bavaria died in 1448 as he was the last King of the Union who was not opposed by either a Swedish King or a "Riksföreståndare" (Steward/regent). Whatever control a Union King could establish proved both limited and shortlived, and they had very little gain to show for their considerable investment of troops and treasure. Still the Union had given the Danish kings a taste of Imperial rule and they would launch go to war in both the mid-16th Century and early 17th Century to try and wipe out Sweden as an independent nation. Well it was exactly what you explained that I meant. I just formulated in clumsily. The cause of the uprising is off course the complaints from the Swedes, but the timing was because of the defeat of the Danish army, including the landsknechts, and the intense prestige loss of King Hans after the Ditmarsken debacle. I forgot to mention that it was not King Hans that lead the army in person where Dolnstein fought, but Crown Prince Christian (II) lead against the Swedes and Henrik Krummedige was leader of the Danish forces fighting in Norway (supported by the town of Oslo). That Dolstein exaggerates is very possible, but the Danish army must certainly have been more than just 1800 German landsknechts. 3000-4000 Swedes sounds like a reasonable number for a hasty response to relieve the Siege at Älvsborg (Göteborg). Maybe 15.000 were the number of commoners on their way in some form (or who in theory could be assembled), but because of hastiness to relieve the siege the force arrived in smaller numbers? We just don't know. The Danish army must also have been of some size as they were conducting a siege and also must have known a Swedish relief response was coming. They were after all trying to put down a combined Norwegian/Swedish rebellion. If the Danish army was 1800 landsknechts and ~2000 Danish nobles + leding drafted commoners it clearly would explain why the Danish army was able to push the Swedes back, but fairly equal numbers also made the Swedes attempt the attack in the first place. The Swedes apparently didn't take the Danish siege forces by surprise. The Kalmar Union was not inevitable going to die. If a Kalmar Union King would have accepted a more puppet role (signed the håndfæstning and not trying to break them) and leaving the Government of Denmark and Sweden to the local nobles, they would have had no reason to revolt. You are perfectly right that Kristoffer of Bavaria walked the line acceptably. The nail in the coffin for the Swedish involvement in the Kalmar Union was very much the result of Christian II "revenge" against the Swedish nobles (at the Stockholm bloodbath in 1520), that had treated his mother (Saxon Queen Christine) badly after the Siege of Stockholm (1501). Had he been more levelheaded and giving the Swedish nobles more autonomy to govern, they could have still have supported the Kalmar Union. It is important to remember that the Danish nobles disliked Christian II as much as the Swedes nobles did. Christian II had executed Torben Oxe in 1517 against the pleas of the Danish "rigsråd" - on the accusation that he had poisoned the Kings dutch mistress Dyveke. That was in direct violation of the "håndfæstning" Christian II had signed to become King. So after that he was hated by the Danish nobility, as well as the fact it was Christian II and Dyveke's mother Sigbret Willoms (who had met Christian II in Bergen) that basically ran the country ignoring the Danish nobles. Some Danish nobles were apparently convinced it was Sigbret (seen as a Dutch witch), who was behind the Stockholm bloodbath. Christian II tried to cut both the Swedish nobles and the Danish nobles out of power, so in 1523 he was deposed in BOTH Sweden and Denmark. So in this episode the Swedish and Danish nobles were allied in a common cause against a "Tyrant". They were both concerned with foreign influence in their lands! It had to be said that the peasants in Denmark were very much were pro-Christian II and rebellions in Jutland, Scania and Blekinge fought to reestablish Christian II's rule as well as Søren Norby from his base in Gotland‚ who was the only major nobleman who stayed loyal to King Christian II. I do wonder how many of the so called "Danish" nobles put by Christian II in Sweden were actually Danish and not German or Dutch?? Though it is possible that some Danish nobles were forced to move to Sweden, so Christian II could decrease his opposition in Denmark? Christian II was an ethnic German King of the Oldenburg line elected as the Kalmar Union King separately in Denmark and Sweden. He was as little "Danish" as he was "Swedish". The last somewhat "Nordic" ruler of Denmark (and creator of the Kalmar Union) was Margrethe I.
Erik of Pomerania's real name was Bogusław (he was still nephew of Margrethe I, though), but he changed it to Erik, when becoming the Kalmar Union King. Kristoffer of Bavaria gives an idea where he was from. It was a deliberate choice by the nobles, so they could have a legitimate King (of the royal line somehow), but one they felt like they could control through force-signed a "Håndfæstning". If the would-be-King didn't sign it he simply wouldn't be elected as king. A non-Danish person would have less local ties and it would take them longer to build up a power base to threaten the "Rigsråd". With Christian II they had miscalculated, but they did manage to drive him off. Then they went to Frederik I, also of the Oldenburg line. Somewhere an Oldenburg count had married a woman, whom back in her genealogical tree had connections with the Danish and Swedish royal house. Graf Conrad of Oldenburg (Ruled 1324-1347) married Ingeburg of Schaumburg-Holstein. She was the daughter of Count Gerhard IV of Plön (Ruled 1312-1323). She was the daughter of Swedish King Valdemar Birgersson (King 1251-1275) and Sofie of Denmark (died 1286). King Valdemar was son of Birger Jarl (1210-1260). Sofie of Denmark was daughter of Danish King Erik IV Plovpenning (King 1232-1250, Duke of Slesvig: 1216-1232). Heilwig's father was Count Gerhard VI of Holstein-Rendsburg (1382-1404) and (Danish) Duke of Slesvig (1386-1404). Count Gerhard VI's mother was Ingeborg of Mecklenburg (died 1395). Ingeborg's mother was Euphemia of Sweden (1317-1379). Euphemia was also the mother of the Swedish King Albrekt of Mecklenburg (1364-1389) and Count of Mecklenburg (as Albrekt II, 1379-1412). Euphemia's father was Swedish Duke Erik Magnusson (1302-1304, 1305-1317), son of Swedish King Magnus "Ladelås" Birgersson (King 1275-1290). Euphemia's mother was Ingeborg of Norway (1301-1361), daughter of King Håkon V of Norway (Ruled 1299-1319). So that's how the Norwegian throne gets connected, but here in b) there are connections to Sweden and not Denmark. But these family connections a+b) do tie into all three Nordic Kingdoms. Christian II was more King "OF" Denmark, Norway and Sweden, than a "Danish" King. He was elected by Nobles in Denmark and Sweden to become Kalmar Union King and send running by both of them in 1523. The Swedish nobles were fighting off a "King of the Swedes" turned Tyrant and the Danish nobles were fighting off a "King of the Danes" turned Tyrant. So the House of Oldenburg was maybe even more Swedish than Danish (meaning a little more drop of blood 100-250 years earlier), but had legitimate (though very vague and in the predominately female line) ties with the old Swedish, Norwegian and Danish royal houses, when we come to early mid 1400's & early 1500's.